If you are tired of expensive greens fees, overbooked tee times and bored with Sunny Spain, seen it all before, scorching temperatures and soggy paella; why not come with me and golf in the unspoiled, relaxed, unknown and future golfing paradise of the Iberian Peninsula - Galicia. 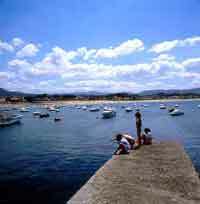 In contrast with the south, this north-western tip of Spain is blessed with spectacular mountainous countryside, eye-catching rivers and valleys that amble west through lush green coniferous forests ending in crushed cockleshell beaches and breathtaking fjords - known as Rias. Golf is not new in this part of Spain. The first 18 hole course was built 35 years ago in Corunna, famous for Sir John Moores heroic stand in 1809 against the French in the Napoleonic Peninsular War. His grave is a shrine revered by the local people. A second course was soon built in Santiago de Compostela. This beautiful par 35, 9 hole course is a stones throw away from the great city whose Cathedral, restored in 1211, houses the remains of St. James the Apostle. Although the city, named after the saint, has become the most sacred place of Christian pilgrimage, it is also a great area for wining and dining in the many superb tapas bars along the Rua dos vinos or wine road. However, at the beginning of the 1990s, ever since Severiano Ballesteros won the battle for hosting the Ryder Cup in Valderrama, the Galicians, another Celtic offshoot of humanity, have woken up to the game. They have subsequently built several new fabulous links open to local and visiting golfers from all over Europe. 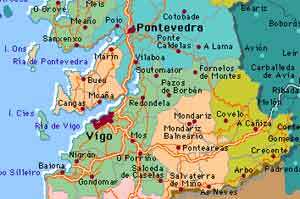 Let me start you off on our golfing holiday by focusing on the province of Pontevedra, to the south, which is blessed with a microclimate, albeit humid, where most of the new courses have been built. The Ria de Vigo golf club, named after the neighbouring city, is an 18 hole championship course. It overlooks the historical sight where the Franco-Spanish fleet were sent to the bottom of the bay by Sir George Rooke in 1702 in the Battle of Rande. There is a strong feeling of vertigo as we look down the fairway of the first hole, perched high on the mountainside. Scuttle your tee shot into the rough, and the anger in your mind will turn into images of ships firing salvos at each other. Drive inland, some 15 miles down the Madrid motorway and then branch off towards the town of Mondariz on the edge of the river Tea. Because of its natural spring spa waters, a health resort was developed here during the 18th century. It was popular throughout Spain as a treatment centre for people suffering from arthritic and other creaky bone problems. The Trypp hotel chain have now redeveloped the area including the renovation of the 150 year old hotel and the construction of a spectacular 18 hole course. Dont be surprised on finishing at the18th hole to putt over a green designed as a mermaid! It is in this latter Ria Arosa on the small island of La Toja, where our next golf course is a must for those visiting the area. Although only 9 holes, and built some 30 years ago, it is in superb condition all year round. It sits on the grounds of the famous 5 star hotel of the same name overlooking a spectacular array of mussel beds. Again you may be surprised, whilst trying to sink that birdie putt on the 4th green that stretches out into the sea, to hear the captain of a nearby tourist ferry shout over the loudspeaker, those people over there are playing a game called golf! In the evening, after a meal of oyster starters, choice of grilled fresh lobster or the local laconada, a concoction of boiled pork, spicy sausage, potatoes and cabbage, you can retire to the Casino to try your luck at poker or blackjack. But what about Galicia itself ? Land of blond haired, blue-eyed farmers and fishermen who believe in fairies, ghosts, goulies and things that go bump in the night. Not your flamenco dancing women or bullfighting matadors. Their music is played with bagpipes and danced to tunes with typical Celtic flare, more in common with their famous cousins of the north. Even the fiestas are different, and consist mainly of religious style rituals but with culinary idols as their god. Be prepared to guzzle wine and dance from village to village, as you praise  and eat - the great potato, or pepper, or squid, or whatever. The people are friendly, hospitable, fun loving but above all, are only too pleased to welcome visitors and maybe even play a round or two with you. Come fly with me and lets see for ourselves! Daily flights, London Heathrow/Santiago de Compostela. £312 return. Weekly ferry services, Plymouth/Santander, Portsmouth/Bilbao. £500 for two plus car. Four to six hour drive. Parador Reyes Católicos, Santiago de Compostela. Price range: Double Room: £40 to 80. Mid season. Large selection. Price range: £25 upwards. Everywhere! Galician food is primarily based on fish and seafood although beef , pork, chicken and lamb stews are common throughout the region. Wines: Famous Alvariño white and the less known Barrantes reds. Prices: £20 plus per couple. Green fees: Range £15 to 30.